In the wake of numerous death threats and vandalism plaguing House Democrats who voted for health insurance reform, many have been asking if the actions of Sarah Palin and other right-wing pundits cross the line from free speech into criminal speech. Sarah Palin published on her Facebook page a list of twenty Democrats who voted for health insurance reform and who are elected in districts that used to be Republican. 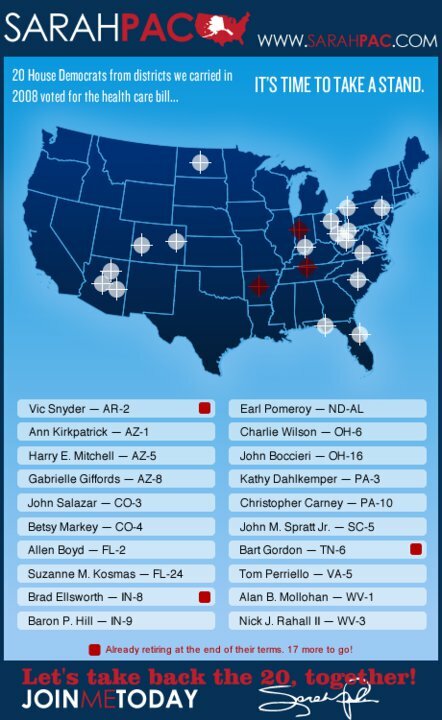 Their locations on a map of the United States are marked by crosshairs - a symbol that clearly refers to target practice and violence. These targeted politicians have received death threats. Their offices and homes and the homes of their family members have been vandalized. They are beefing up security measures for themselves and those who are close to them. Sarah Palin might be to blame. But she is not a criminal. The Supreme Court has a high standard for criminalizing speech. Free speech, while not an absolute right, is a highly protected privilege in the United States. Under certain narrow circumstances, the government can punish or prevent speech when "the words are used in such circumstances and are of such a nature to create a clear and present danger that they will bring about the substantive evils that Congress has a right to prevent." (Schenck v. United States, 1919). This was translated in 1970 into a legal test that demands criminal speech 1) be directed to inciting or producing imminent lawless action" and 2) be "likely to produce such action." (Brandenburg v. Ohio, 1970). As Justice Brandeis pointed out in his concurring opinion on the subject of incitement to violence, "If there is time to expose through discussion the falsehood and fallacies, to avert the evil by the process of education, the remedy to be applied is more speech, not enforced silence." (Whitney v. California, 1927). In Brandenburg, this legal test was applied and the Supreme Court found that a call for revenge if "our President, our Congress, our Supreme Court continues to suppress the white, Caucasian race" was not criminal speech. The saving grace for the crazy revenge talk and gun imagery used in Palin's ad is that it does not create the expectation of imminent harm. Sure, harm has occurred. There have been incidents. But the speech itself does not go so far as to encourage immediate and concrete action. There is time, as Brandeis pointed out, for reasoned discussion and debate. It is a good thing that we don't criminalize the kind of ads Palin is producing. First, they are expressly political. Political speech is the highest form of protected speech under the First Amendment and that is necessary to preserve democratic function. We simply have to tolerate extreme points of view in order to prevent a tyranny of the majority and repression of the minority. Second, expressions of frustration, anger and wishes for revenge are very different from actions that violate criminal law. We punish actions because the create harm. The speech does not. The only time that we criminalize speech is when the very act of speaking so clearly and immediately leads to harm that there is really no way to separate out the act of speaking and the violence that ensues (according to a seminal essay by Zechariah Chafee Jr., Free Speech in the United States, 1948). That doesn't mean Palin's use of violent imagery isn't offensive. She is a public figure, a former candidate for the second highest office in the country. Her words have a great effect on the public and should be chosen carefully. On the other hand, if we really wanted to hold politicians to a higher standard of speech, we'd have more than just one member of the Republican party to worry about.